Spray foam insulation is a little more expensive than traditional fiberglass insulation but with the ever increasing cost of energy prices, the extra expense may be worth it. Spray foam insulation is a polyurethane-based product that is sprayed directly into the area in which you are insulating. Special equipment is used to spray the insulation and protective gear is worn during the spraying process, a few reasons why this job is best left to the professionals. It fills in the gaps: The foam adheres to all the surfaces on which it is sprayed. This means every crack and crevice is filled. This effectively prevents heat from escaping and cold air from creeping in during the cold months and vice versa during the warm months. It resists mold and mildew: By bonding tightly to the solid structures of a building, it prevents air from traveling in or out of the building. As warm air moves through a heated building (known as heat transfer) and comes contact with the cooler outside air, condensation occurs. This moisture causes mold and mildew. Since spray foam thoroughly insulates every crack and crevice, it prevents the transfer that leads to condensation, which leads to mold and mildew. Spray foam stays in place: Other forms of insulation, such as fiberglass sheets or cellulose, either sag or settle over time. This causes "cold spots" on your walls, signifying that the insulation in that particular spot behind the wall is no longer there. Since spray foam adheres to the structure, it does not say or settle over time. Higher R-Value: If you have ever read anything about insulation, you know about the all important R-Value. The R-Value measurement of insulation refers to the level at which the insulation prevents heat transfer. The higher the R-value, the better protection. As an insulator spray foam has the highest R-value of any other form of insulation. Though there are many pros to using this product for insulating your home, there are also a few cons you should keep in mind before deciding to use spray foam. 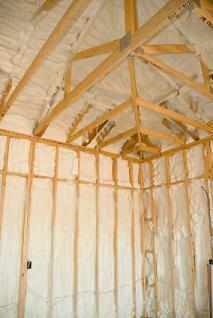 The cost: Perhaps the biggest drawback of using spray foam is the expense. Contractors estimate that the cost of using spray foam is two to three times higher than that of using other types of insulation. The main contributor to the higher cost is that this product must be installed by a professional. Below-grade application: This point is arguable, but should be a consideration nonetheless. Many professionals state the using spray foam as an insulator below grade attracts termites and thus they do not recommend it. Others state that if you use a stronger spray foam product, you will have no problems with termites. It's best to consult with a professional on this subject. Energy efficiency: Spray foam is said to reduce energy costs in your home by as much as up to 50 percent. That is huge savings per year when you consider the steeply rising cost of energy. Resale value: Preliminary reports indicate that spray foam is a factor in the higher resale value of homes, due largely in part to the product's energy efficiency. The initial upfront cost is typically offset within three years. This means that after three years, the insulation will have paid for itself in the form of energy bill savings. A 2,000 square foot home insulated in foam, as opposed to cheaper, more traditional fiberglass, saves the homeowner over $1,000 in energy costs. Finally, consult with a few different insulation professionals to get their expert opinion on the type of insulation you choose for your home.